Home The Guide to Growing and Eating Heirloom Tomatoes What is an Heirloom Tomato? There is a lot of buzz among gardeners about heirloom seeds, especially heirloom tomato seeds. 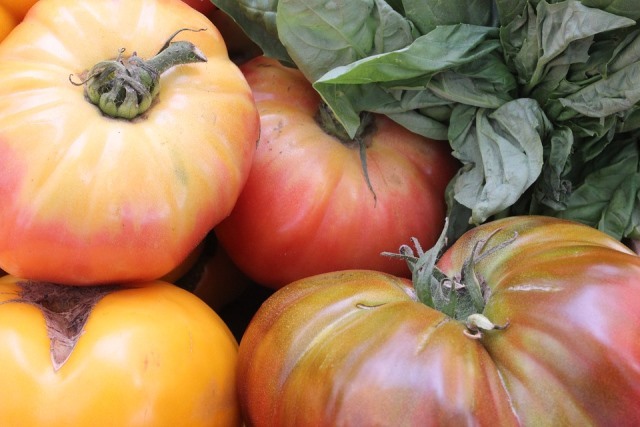 If you’re thinking, “Wait a minute, what is an heirloom tomato?” don’t worry, you’re not alone! We’ll help you understand exactly what the term means before you go out shopping for heirloom tomatoes. Let’s start out with heirloom seeds in general. Heirloom seeds have been passed down from generation to generation in a particular family, region or area, and have typically been selected for a particular trait. Some people say that an heirloom seed must have a history of at least 50 or 100 years, or have been an established variety before 1945. At the end of WWII industrial agriculture took off and hybrid seeds became popular. However, their are many new heirloom seeds popping up all over the world. The most important trait that these seeds share is that they are open pollinated, which means they reproduce without the help of humans. It follows that an heirloom tomato is one that grows from an heirloom tomato seed. There are hundreds of varieties of heirloom tomatoes. They come in small and large sizes, a rainbow of colors and can tolerate a wide range of climates. There are many Russian heirloom tomatoes that can handle cold weather or produce early, while other types thrive in hot humid summers. You may have heard the term “heritage tomato seed” in addition to “heirloom tomato seed.” What is the difference? The short answer is that there isn’t one. The term heritage is commonly applied to breeds of animals. A heritage breed of goat, chicken or pig is the livestock equivalent of an heirloom vegetable. The two terms can be used interchangeably, though heirloom is the most correct when describing tomatoes. Heirloom tomatoes aren’t popular because they are open pollinated (though many gardeners like being able to save their own seed) or because they are old. They are popular because the average heirloom tomato tastes a hundred times better than a hybrid tomato. They come in a variety of colors, from red to pink to green, purple, golden and even black. They can be acidic, sweet or perfectly balanced. Biting into an heirloom tomato is like eating a little piece of summer. Heirloom seeds are also a critical piece of self-sufficiency and independence. You don’t have to rely on the seed company to provide you with garden vegetables each year, and you are free to select the best plants and fruits in your garden and thus improve your own personal strain over time. Green Zebra – This tomato is fully ripe and still green, with striking zebra stripes running down it. Bring a splash of color to your salad or sandwich. Purple Cherokee – A dark, dusky tomato, the Purple Cherokee is known for its distinctive salted flavor. Brandywine – One of the nicest slicing tomatoes available, Brandywines are perhaps the most commonly grown heirloom tomato. For a (nearly) complete list of heirloom tomatoes check out Tatiana’s Tomato Base.